Ford has finally revealed the power and torque specs for its spanking new Focus RS with the occasion of the car’s global public dynamic debut at the Goodwood Festival of Speed. 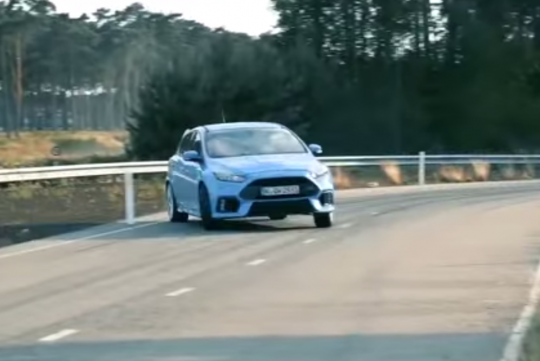 To be driven up the hill by Rallycross star Ken Block, the 2.3-litre EcoBoost turbocharged four-cylinder engine produces 345hp at 6,800rpm and 440Nm (324lb-ft) of torque between 2,000 and 4,500rpm. An overboost function increases peak torque to 470Nm for up to 15 seconds during hard acceleration. Based on the engine that is also found in the four-cylinder Mustang, it produces 10 percent more power here thanks to a new low inertia twin-scroll turbocharger with larger compressor that delivers significantly greater air flow, as well as a much bigger intercooler to maximize charge density. Engineers also improved engine breathing by using a less restrictive intake design, while the addition of a large-bore high performance exhaust system with an electronically controlled valve in the tailpipe helps optimize the balance of back pressure and noise output. Those who love exhausts that spit and crackle, you can start breaking your piggybank now.